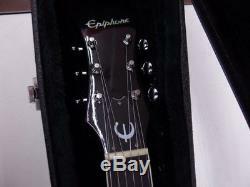 Brand: Epiphone Product name: CASINO VC Serial number: R99 0576 Accessory: Special hard case Condition: Excellent condition There is a dent on the back of the neck. Are noticeable in places and places, but it is a product that can be seen as condition deterioration of the material itself, but it is still a product you can use. Asia, Canada, China, Mexico, Japan, Australia. Europe, United Kingdom, Germany, France, Russian Federation. We do not mark merchandise values below value or mark items as "gifts" - US and International government regulations prohibit such behavior. The item "Epiphone CASINO VC Electric Guitar used Excellent condition from japan sound" is in sale since Thursday, June 21, 2018. 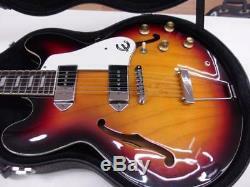 This item is in the category "Musical Instruments & Gear\Guitars & Basses\Electric Guitars". 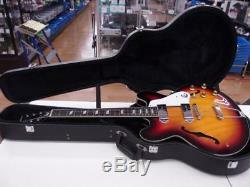 The seller is "fe-shop-japan" and is located in koriyama. This item can be shipped worldwide.